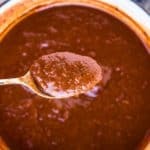 This easy enchilada sauce has deep flavor–a smoky spiciness from lightly toasted dried red chiles and the round, deep sweetness of dark raisins. It goes perfectly with enchiladas, whether they’re filled with pork, chicken, cheese, or vegetables. It is also delicious with homemade tamales or chilaquiles. This recipe makes enough for two batches of Homemade Chicken Enchiladas, but I like to keep a stash in the freezer for future meals. Heat a large saucepan over high heat. Add the chiles and cook, stirring, for about 1 minute, just until the chiles become aromatic. Cover the chiles completely with water (about 4 cups) and bring to a boil. Remove from the heat, stir in the raisins, and let sit for about 30 minutes. Transfer the chiles and raisins to a blender, reserving the soaking water. Add the garlic, tomato paste, cumin, oregano, and salt, along with about 2 cups of the soaking water (if the chilies are very spicy, you can substitute chicken broth, vegetable broth, or water for some or all of the soaking liquid), and process to a smooth puree. Add the remaining water and process to combine. Heat the oil in the saucepan over medium-high heat. Sprinkle the flour over the oil and cook, whisking constantly, until the mixture begins to brown and give off a nutty aroma, 2 to 3 minutes. Reduce the heat to medium-low, add the pureed chile mixture, and simmer until the sauce thickens, 10 to 15 minutes. Use immediately or let cool and store in a glass jar in the refrigerator for up to a week or in a resealable plastic bag in the freezer for up to 3 months.